The holiday season is usually a pretty hectic time for everyone, so just imagine adding on a major move! That’s right, my heartmate and I packed it all up and are settling into our brand new home in LA’s El Sereno neighborhood. Well, I’m all packed up. He’s actually moving next summer. We're still keeping our New Orleans home and we'll be bi-coastal. I can’t believe how quickly that all happened! I’m still in shock. For my non-LA locals, El Sereno is east of Downtown. And considering the fact that I was born and raised as an east side boy (Chinatown, Lincoln Heights, Highland Park, and finally settling in Alhambra), I really feel at home here and as stressful as it can be, I’ve gotten excited about nesting in our new abode. 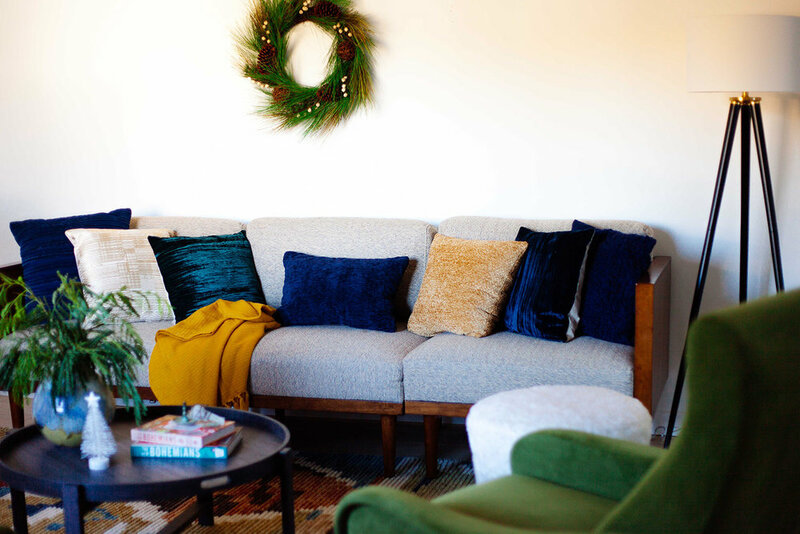 Thankfully, Overstock has been helping me make the house really feel like home — especially as the holidays near! I’m making it my mission to have the whole fam over, including my sweet niece Kaley who’s never had a proper Christmas. She’s eleven and never had a Christmas tree! I just can’t even! As a result, I not only needed to create a living room that could comfortably accommodate the whole crew, but was also appropriately festive. I’ve never really been the type to go ham on Christmas décor. Just like my standard design philosophy, I like to keep the big pieces in a room relatively neutral and then spice things up with fun accessories that capture my bohemian style. Overstock is pretty much a one-stop-shop so I was able to get everything I needed (yes, including the tree!). What’s even better is that they are offering a ton of great deals every day leading up to the holidays beyond their already low prices, plus free shipping on orders over $45! It’s all about the free shipping. I shop using Overstock’s AR app, which uses augmented reality to see what pieces would look like in my actual space. It’s genius. This hand-knotted area rug in an earthy color palette stood out immediately as something what would tie everything together. I chose a 9x12 because I wanted the rug to cover almost the entire room so it'll look bigger. The space is about 12x12. The curvy hunter green chairs in velvet go with it perfectly but they’re also colorful to stand out. The mid-century modern style sofa is sleek and minimal. You might have seen me use it once before in Han’s living room. I love it so much I decided to order one for myself. Even though it’s got a vintage look, it goes with just about everything. Then I added a dark grey coffee table, fluffy white ottoman — which can be used as extra seating — and a gold accent lamp (I dressed up with a colorful tassel, of course) for a little extra sparkle. In terms of my holiday décor, the most important piece was this pre-lit tree. Now, generally I’m always a live tree person but it bums me out to see all the dead trees piled up on the curb once Christmas is over. So sad! It was easy to add this tall, slender artificial Christmas tree on while I shopped for my furniture on Overstock. I won’t have to toss it when I’m done and I don’t have to worry about stringing the lights — a total time saver. I also found the mercury glass ornaments, which have a vintage feel but are classic. Then I threw on some more tassels and some letter ornaments to represent the names of my family and my love to add even more personality. With not much time (we literally just moved in) to prepare, it was so simple to get everything together for holiday entertaining with the help of Overstock. Now if only they could help me with all the cooking! Stay tuned for more snaps of my new home!